Indeed, the cultural narrative that celebrates entrepreneurial inventiveness often views this creativity as happening in bubbles outside of the mainstream corporate world. The business press ascribes a level of magic to companies created by iconic founders, such as Amazon, Apple and Pixar, holding them up as special and somehow different from other corporations. But is it really the spark of genius that distinguishes these organizations? Or does their repeated success in developing wildly successful new products and services have more to do with culture, process, and environment? I believe it’s the latter. And this raises an intriguing question: is it possible to break through the barriers between those creative companies and the rest of the corporate world, building within conventional businesses the ideal conditions for entrepreneurial thinking? I believe we can – and the recipe for doing is found in the maker movement. The maker movement is a cultural phenomenon that celebrates shared experimentation, iterative learning and discovery through connected communities that build together while always emphasizing creativity over criticism. We are all born creative. Then why does criticizing instead of creating become the default practice in many corporate cultures? Reacting to the explosion of information in the last few decades, we have increasingly trained ourselves to be consumers of data, giving rise to a culture where we place great value on evaluative and analytical skills. In the workplace, the critic is rewarded – for vigilance, for risk management, for seeing the future and for avoiding danger and crises – while the creator mindset begins to atrophy. The rise of scheduled business meetings, which now consume 15 percent of an organization’s workday, has contributed to this. Formal meetings become performative events, where participants feel the need to say something – anything! – and serving as the critic of someone else’s idea is sometimes the easiest and safest way to offer input. Although an informed critique has tremendous value, input often comes from critics who are playing it safe while avoiding the risk of being seen as failed creators. Another contributor to the culture of criticism is the disproportionate career tax on failure. How many of us have heard colleagues or teammates express grave concern about someone who is taking a risk, predicting their downfall because they should have had the “good sense” to play it safe? It’s often seen as better to be the person shouting instructions from the bottom of the mountain than the person who hits a measurement milestone while dangling from a cliff. 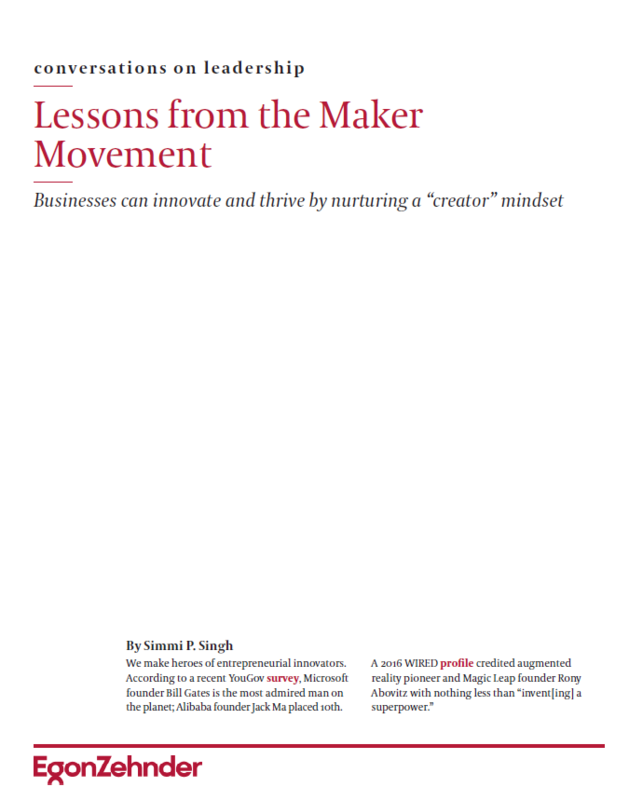 The good news for the business world is that a powerful alternate model exists: the maker movement, which celebrates the potential of hands-on creation. Makers represent a growing community of builders and creators – engineers, scientists, artists, and hobbyists of all ages, interests and skill levels who engage in experimentation, collaboration, and innovation based on open-source principles. In a seminal 2009 lecture, Hal Varian, the chief economist at Google, spoke about how the Wright brothers combined bicycle technology, kite technology and the gasoline engine to create their flying machine in 1903. This example is so relevant 115 years later because the idea of strange bedfellows – what Varian calls “combinatorial innovation” – is the very essence of the maker movement. How can ideas, discoveries, technologies and concepts be brought together using out-of-the-box interdisciplinary thinking to create magic? Makers like Elon Musk of Tesla Inc. and corporations like Ford Motor Co. represent examples of this at two ends of the spectrum. Both are working at being makers every day – combining progress in many different fields such as physics and computer science (machine vision), energy (battery technology), math (algorithms, GPS), and computer-aided design – to invent self-driving cars. So many of the scientific breakthroughs developed by the Defense Advanced Research Projects Agency (DARPA) and NASA are at the core of the work SpaceX is doing to build a rocket capable of landing on Mars. In a sense, the philosophy underlying the maker movement is as old as time. Today’s vibrant maker movement builds on this tradition and Make: magazine, founded in 2005 by Dale Dougherty, has helped popularize this movement and propel it forward. In true open-source form, the magazine brought together diverse communities involved in the process of creating things through hands-on efforts – from needlepoint to robotics. In the same year, Dougherty began to host physical gatherings known as “Maker Faires,” billed as “part science fair, part county fair, and part something entirely new,” where participants come together to learn, teach, and share their creativity and resourcefulness. They became so influential that the Office of Science and Technology Policy hosted its own Maker Faire at the White House in 2014. This sensibility is revitalizing cities across America, where the core tenets of this movement are helping spur innovation in cities from Chattanooga, Tennesse; Detroit, Michigan; and San Francisco, California. Pittsburgh represents an inspiring example: academic institutions provided robotics expertise, Silicon Valley sent in teams from Google, and the city built parks and maker spaces such as Techshop – all of which have helped transform the urban core of this rust belt city into a thriving center for innovation. 1. Embracing the creator identity. The starting point in the maker life cycle has been defined as “Zero to Maker,” when an individual defines a passion project or idea and learns the skills and accesses the tools to bring that vision into reality. David Lang has described how he found a problem he wanted to solve (building an underwater robot) and went about acquiring every skill he needed to do this, in the process cofounding OpenROV Inc, based in Berkeley, California, a community of citizen ocean explorers and creators of low-cost underwater robots. Businesses need to help employees find and embrace their own maker identities. A 2013 hackathon held by Hasbro Inc., for example, drew 150 attendees who developed 45 products – equivalent to billions of dollars in traditional R&D, according to one expert. 2. Fostering interaction among creators. The second step in the life cycle is “maker to maker” – to develop as a creator, you must collaborate. Conventional corporate thinking, however, can create an environment where individual creators are surrounded by critics and editors to better channel their efforts. While this is essential, too much can stymie creative experimentation. Organizations should create explicit opportunities for creator-to-creator interaction and teaming. GE Appliances has done just this through their partnership with open-source hardware innovator Local Motors Inc., based in Phoenix, Arizona, launching FirstBuild in 2014, an open platform to source collaborative ideas from a community of engineers, scientists, fabricators, designers and enthusiasts to refine existing GE appliances, as well as create and build new designs in a micro-factory. 3. Insisting on fluidity. If the creation of physical objects is the core of the Maker movement, the second most important element is the belief that all kinds of creation are equal. Rigid taxonomies – and the associated silos they spawn – only dampen innovation. Since its inception in 1980, the MIT Media Lab – which calls itself “an antidisciplinary research lab” – has brought together interdisciplinary teams to transform how humans experience, and can be aided by, technology. Its Programmable Droplets project, for instance, brings lessons from electronics and integrated circuits to biological research, aiming to revolutionize the drug discovery process. 4. Understanding the effectiveness of novel play. Key to the Maker movement are makerspaces – workspaces with shared tools that are open to the community, balancing the opportunity to create with the opportunity to learn with and from others. 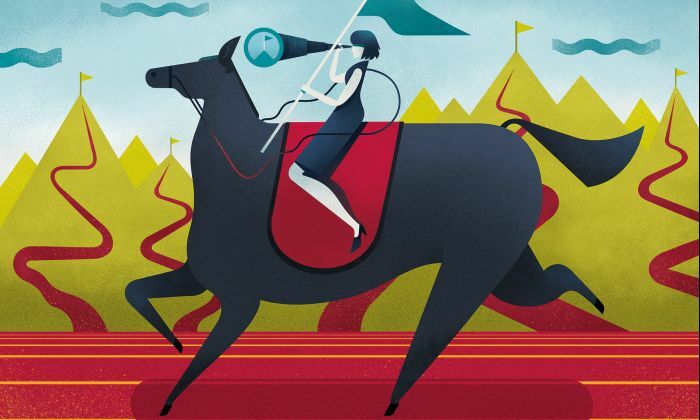 Working with novel materials and different media (both physical and digital) is mind expanding; according to brain science expert Srini Pillay, the mind is far more creative when allowed to wander away from its default pathways. Tinkering with physical making and unfamiliar tools encourages just this kind of intellectual wandering and can enhance creative efforts. From the 60-foot tall trees in Amazon’s new glass-paneled domes, the Spheres to the exquisitely finished door handles at Apple Inc.’s new headquarters, the world’s most innovative companies invest in the idea that how their employees experience the workplace is intimately connected to how they think and what they create. 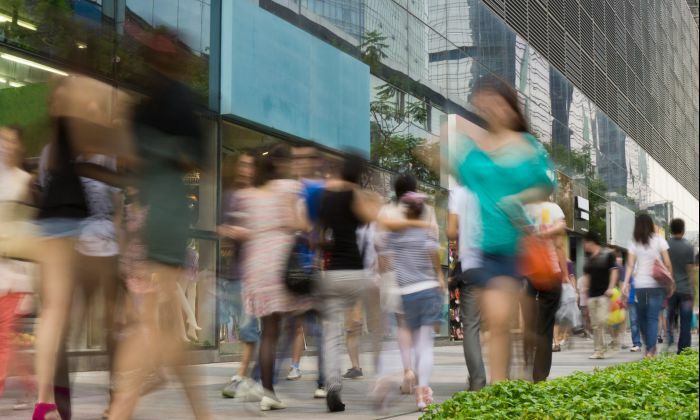 Developing physical and intellectual spaces to discover, explore, and connect in unstructured ways is crucial for businesses to move from the culture of criticism to a culture of creation. The maker movement doesn’t have all the answers. Elements such as organizational culture, performance evaluations, compensation, job titles, and even fundamental business missions will have to be re-examined for this significant shift from critics to creators to take place. Yet the movement does provide a road map for helping employees redefine themselves as creators and, therefore, innovators. Because today, no business can afford to be populated by those who simply sit back and criticize. 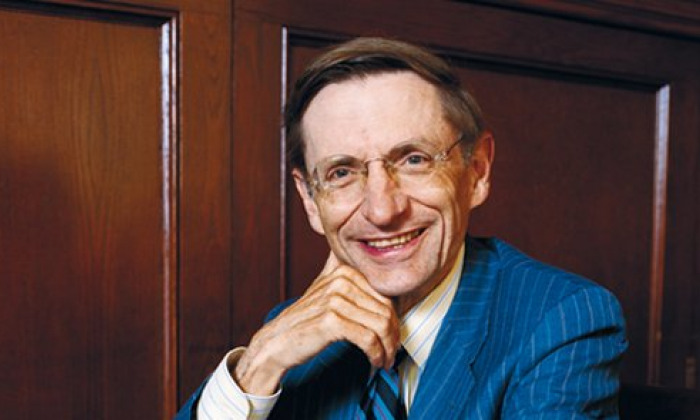 Bill Drayton is a changemaker and an ambitious one at that. Through his “citizen sector” organization Ashoka (Drayton does not use the term non-profit), he is playing the instruments of capitalism to orchestrate social change.